Kimchi, a traditional Korean food, has been gracing Korean tables as a staple side dish for thousands of years. If you count the various types of cabbage used, other vegetable ingredients, the region where it’s made, and preparation methods, you’ll find over 160 types of kimchi. The reason why it’s so popular in Korea is not just because of its traditional taste, but also because of its health benefits. You can think of kimchi as a vegetable equivalent of yogurt with a lot of probiotic benefits. This is because kimchi is not cooked, rather it’s made through fermentation using lactic acid bacteria. The fermentation process not only gets rid of pathogenic and decay-causing bacteria but it also increases the health benefits of kimchi. Kimchi is usually made with cruciferous vegetables, garlic, red pepper powder, ginger, and many other healthy ingredients. If you’re looking for a superfood that will transform you into a healthier person, kimchi is the best candidate. It’s low-calorie, nutrient-packed, and loaded with fiber. Just to mention a few, kimchi contains vitamins A, B1, B2, and C. It also has a lot of selenium, iron, and calcium. It’s not just low-sugar, it’s also high in lactobacillus bacteria. It contains flavonoids, capsaicin, carotenoids, chlorophyll, and phenols. It’s also extremely low-fat, which makes it an absolutely healthy dish. Here are five amazing health benefits of this uber healthy superfood. If you’re trying to lose weight but just can’t stop eating, try incorporating kimchi in your diet and you’ll start seeing wonders. Since kimchi is made with a lot of healthy vegetables, you’ll get a lot of fibers which can help you feel sated. Kimchi can also give you solid weight loss improvements. In one study involving 22 overweight and obese patients fed with fresh or fermented kimchi for 4 weeks, it was found that kimchi offers a lot of anti-obesity benefits. The patients showed significant reduction in body mass index (BMI), body weight, and body fat. Moreover, those who ate fermented kimchi experienced more waist-hip ratio and fasting blood glucose reductions. Aside from reducing body weight, kimchi can also help fight diabetes. One study involving diabetic patients revealed that those who regularly ate kimchi showed improved glucose tolerance as well as lower levels of fasting glucose. Because kimchi is a probiotic food, it can influence insulin resistance as well as glucose metabolism, which are the two main diabetic risks. One study compared the effects of regularly eating 15 grams of kimchi versus 210 grams of kimchi. It was found that both resulted to lower fasting blood glucose and total glucose. However, the percent reduction was much higher with the group eating the bigger serving. So if you’re planning to include kimchi in your daily diet, just make sure you eat more than just a spoonful every meal. Kimchi can help improve insulin function. If eaten regularly, kimchi can also help decrease blood sugar levels. Moreover, since kimchi contains a lot of dietary fiber, it further helps in delaying glucose absorption in the body, thus preventing spikes in blood sugar levels after meals. For best results, eat kimchi as a side dish along with a low-fat diet. Eating kimchi regularly is a delicious and healthy way to decrease your bad cholesterol levels. It’s also proven to help lower blood pressure. For better results, eat fermented kimchi instead of fresh kimchi. 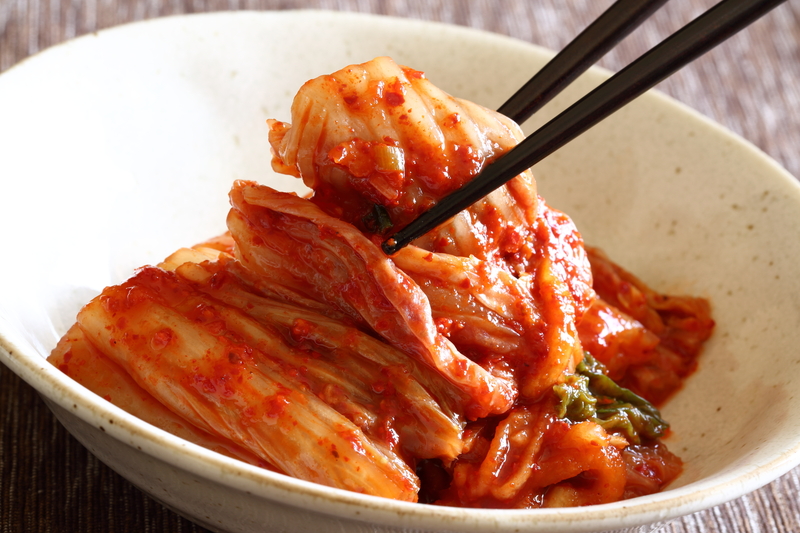 Between the two, fermented kimchi has been shown to have better results in terms of improving metabolic syndrome, lowering blood pressure, and reducing total cholesterol and percent body fat. You don’t even need to eat a lot of kimchi every meal. One study compared the effects of eating large servings of kimchi versus eating only a small serving. A hundred young men were divided into two groups. For a week, one group was fed huge amounts of kimchi, while the other was fed only small servings. The results showed that both groups experienced lower cholesterol levels. This means that to lower your cholesterol levels, eating a small serving of kimchi every day will already suffice. Most, if not all, of the common kimchi ingredients have antioxidant properties. Cabbage, for instance, is packed with flavonoids and phenols. Currently, 15 different phenols and close to 20 flavonoids have been found in cabbage. And the best thing about it is that all these phenols and flavonoids show significant antioxidant activities. In red cabbages, for example, cyanidin was identified as the main agent responsible for antioxidant activities. Moreover, cabbage has a constituent that’s known to help prevent colon cancer. Other common kimchi ingredients include radish, garlic, red pepper, and ginger. All of these have antioxidant properties as well as anti-inflammatory properties. This is why kimchi is such a great food for preventing cancers. Red pepper contains capsaicin which helps prevent lung cancer, whereas garlic contains allicin which is good for liver, thyroid, and stomach cancer. Have you ever noticed that Koreans, in general, have smooth complexions and are young-looking? This may be not just an ethnic trait but also a result of their diet. Fermented kimchi is extremely rich in antioxidants, the body’s number one weapon against skin aging. For best anti-aging results, eat kimchi that’s been fermented for at least half a month or longer. Studies show that the longer kimchi is fermented, the higher its antioxidant activities get. And the more antioxidants, the more anti-aging action you get. Kimchi fights skin aging by relieving oxidative stress at the cellular level and by regulating the cellular inflammatory process. This means that when your skin gets damaged because of stress and oxidation, kimchi treatment can actually bring your cells back to life and even extend your cells’ lifespan. Although kimchi is gaining global popularity as a superfood, its health benefits have not all been explored. 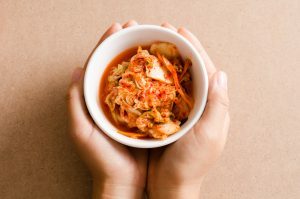 What scientists have proven so far is that kimchi is not just an excellent source of probiotics, which means it’s great for your digestive health. Kimchi also has anti-constipation properties, mainly because of its high dietary fiber content. It’s also associated with colorectal health promotion, fibrolytic effect, immune system enhancement, and brain health promotion. In short, kimchi is just totally healthy for you.